No greasing or spraying required! 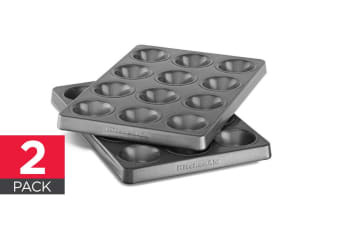 Multiple mini treats have never been easier with these awesome professional-grade mini muffin pans. These KitchenAid Professional-Grade Nonstick 12 Cavity Muffin Pans – Mini are made with a steel core to provide durability and warp resistance, and an aluminum surface for even-heating and better baking results. The swiss-engineered multi-layer nonstick coating eliminates the need for spraying or greasing, saving you time and producing perfect mini muffins and cupcakes which just fall out of the pan.